As I stood in front of this amazing artifact, first carved in 781, I wondered why it would not be one of the eight wonders of the world. It so clearly testifies to the existence along the Silk Road (of which Xi’an, then known as Chang’an, was the most eastern terminus) of various faiths, in this case Christianity represented in the Church of the East. 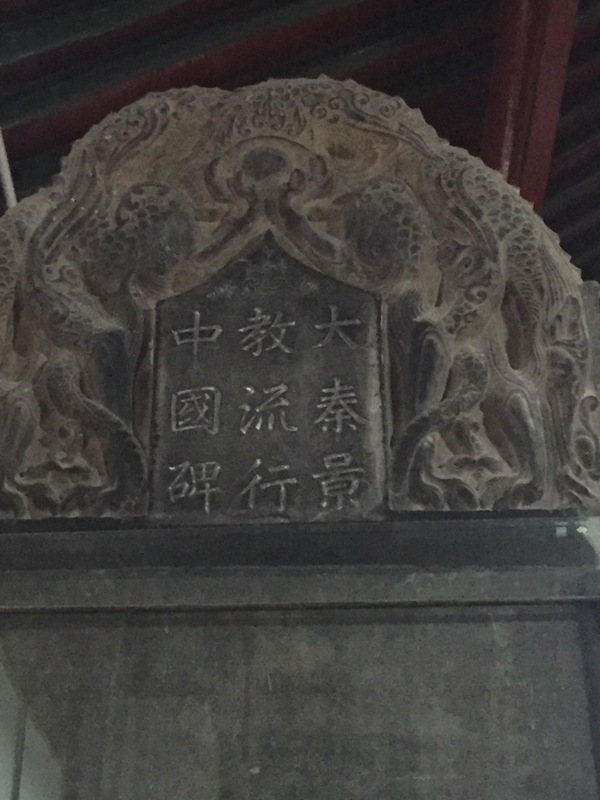 At the top of the Stele is the Church of the East cross, contextualized for China as it sits in a lotus flower. Then below is the history from 635 to 781 in Chinese of the Church in China. At the bottom in both Syriac and Chinese are the priests and leaders of the Church present in 781 as it was finished. The inscription goes on to give a lengthy proclamation that the Emperor issued, indeed disseminating this new faith far and wide in his realm. It was interesting that as we visited the Stele in the museum in Xi’an a few weeks ago, a nearby tour guide gave the opinion that perhaps the Emperor had even decided to become a Christian himself! This from someone who appeared to not be a Christian himself from other comments he made. By that point in history, missionaries from the Jesuit order had entered to work in China, and they became aware of the stone tablet. 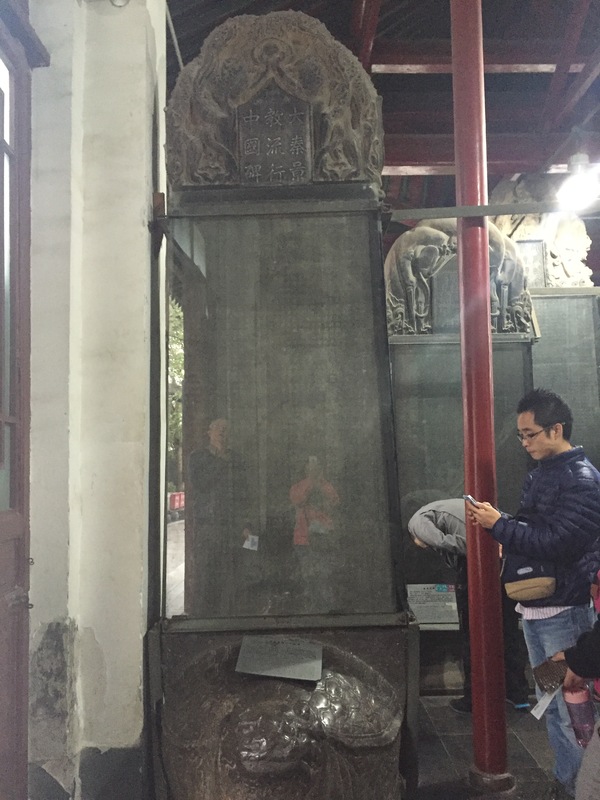 A miracle in history is that all through the centuries that followed, including the Cultural Revolution of the 1960’s, the Stele was preserved. As mentioned, it is now securely housed in a beautiful museum in the heart of modern Xi’an. It is hard to imagine that for 780 years this monument to the past was buried in the ground. As I wrote in the last post about the Terracotta warriors, what else may lie buried as important evidence for the existence of cultures and faiths from the past? As I stood in front of this monument, I felt a need to touch it and enter directly into the amazingly long story. Without seeing the sign “do not touch” (conveniently), I walked behind it and laid my hand on it. I didn’t feel anything particularly, but the idea of touching something like this Stele that was such an important evidence of the past moved me deeply. There are few evidences left of the early period of Chinese Christianity from the 7th-9th centuries. 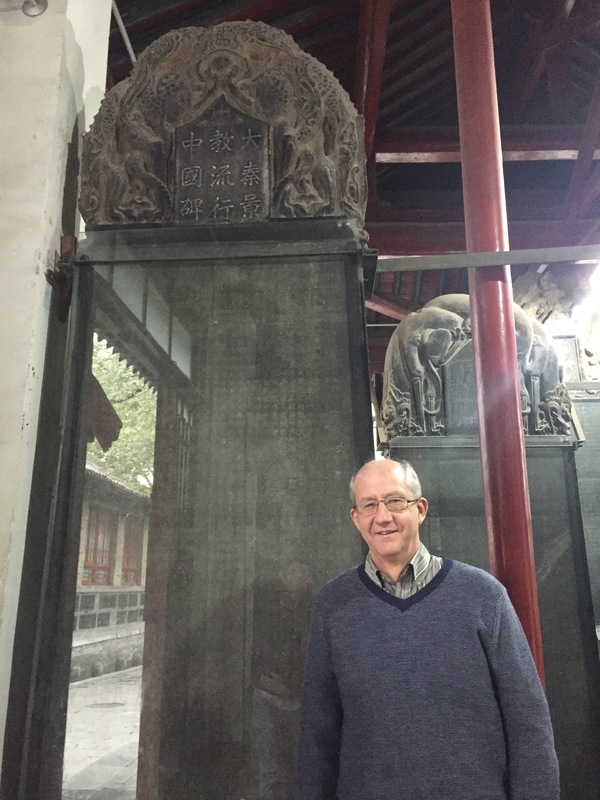 This Stele is the most detailed and comprehensive record of the history. In the next post I’ll describe another possible evidence, not as definitive as the Stele, but certainly very plausible. Look for that in the next few days. Previous Post What Else Lies Buried?